Resident Evil 7: Biohazard takes the iconic horror series back to its survival horror roots. Our Resident Evil 7 walkthrough will make surviving a little easier. 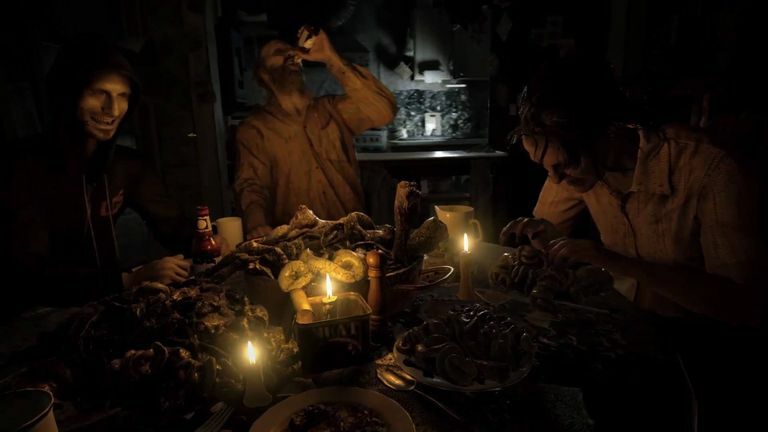 The following Resident Evil 7 cheats apply to all versions of the game including the PS4, Xbox One, Nintendo Switch, and Microsoft Windows editions. To unlock infinite ammo for all of your weapons in the main campaign, beat the game on Madhouse difficulty. To unlock infinite ammo in the "Not A Hero" DLC, beat the campaign on Professional difficulty. There are more antique coins (33 in all) to collect. There are no automatic checkpoints. Completing various objectives will unlock secret items. Add support items to your inventory for them to take effect. Beat the game on Easy or Normal difficulty. Take less damage while blocking. Beat the game on any difficulty in less than four hours. Permanent psychostimulant effect helps you easily locate items. Walking Shoes Beat the game on any difficulty in less than four hours. Walk faster. Beat the game on Easy or Normal difficulty. A powerful handgun. Circular Saw Beat the game on any difficulty in less than four hours. A powerful short range weapon. Resident Evil 7 has two possible endings. Which one you get depends on a decision you make during the story. After fighting the big mutant boss, you're given the option to cure either Mia or Zoe. Give the serum to Mia to see the good ending; give it to Zoe for the bad ending. You'll need to see both if you want to earn every trophy. After beating the game, your health and reload speed will carry over to your next playthrough, which is extremely helpful for surviving Madhouse mode. Any secret items you unlocked will appear in the item box. Press the block button while using a health bottle or reloading your weapon to cut the animation short. If you time it right, you'll get the full benefit of the action with half the time delay. This trick can be a life saver as it gives you a few extra seconds to get out of tight situations. To earn every trophy, you must complete the game at least three times. Create all items containing chem fluid and strong chem fluid. A-ha! Closely examine an item. Arms in the Air Block an enemy attack. Be Kind, Please Rewind Watch all the videotapes during a playthrough. Behind Closed Doors Close an open door. Avoid Marguerite during the "Mia" videotape. Duck If You Love Life Crouch to avoid Jack's scissors attack. End of the Night See the bad ending. Shoot Marguerite as she lunges at you. He's Here, There, Everywhere! Destroy a Mr. Everywhere statuette. In the Bag Increase your item slots. Just A Memory Now See the good ending. Just Get Me Outta Here Beat the game in less than four hours. Mad Pelicans Find every antique coin in Madhouse difficulty. Master of Unlocking Use a lock pick. Destroy every Mr. Everywhere statuette. Open Your Eyes Use psychostimulants. Nice Try Use a shadow plinth with an unrelated object. Finish the "Happy Birthday" videotape in under 5 minutes. Obtain every antique coin in Easy or Normal difficulty. Playing it Safe Beat the game on Easy difficulty. Open the item box three times or less during a playthrough. She's Alive Travel to Louisiana. Slash Slash, Slashity Slash! Remove all insects from a door with the knife. Defeat an enemy with a remote bomb. The Devil Is in the Details Read every file during a playthrough. The Grave Will Out the Truth Solve the secret of the old house. Things Got Personal Defeat an enemy with the knife. Walk it Off Beat the game using three first aid meds or less. Who's Your Daddy Now? Beat the game on Madhouse difficulty. You Ain't Gettin' Away Escape to the yard. You Better Start Running Escape the Baker family house. Resident Evil 7 Gold Edition comes with alternate scenarios that can otherwise be purchased as DLC. Each scenario has its own share of goodies to unlock. AM78 left-hand glove Beat the scenario on Normal difficulty. Joe Must Die difficulty Beat the scenario on any difficulty. Beat the scenario on Normal difficulty. Extreme+ Challenges Beat the scenario on Joe Must Die difficulty. AM78-a gloves for both hands Beat the scenario on Joe Must Die difficulty. Infinite Weapons Complete all Extreme+ Challenges. 1% attack boost Find boxer effigies. 5% attack boost Find champion effigies. Beat the scenario in less than an hour. Walk faster Collect all antique coins. Thor's Hammer Sight B Beat the scenario on any difficulty. Professional difficulty Beat the scenario on any difficulty. Infinite ammo Beat the scenario on Professional difficulty. When you first go to the laundry room, check Lucas' phone in to get the code "1019." Get the lock pick in the crawlspace beneath the Main House 1F: Pantry. Go upstairs and use the lock pick on the drawer in the bathroom to collect the small component. Before approaching Eveline in her bedroom, use the small component on the nearby trophy to reveal a ladder. Climb the ladder to the attic and input "1019" into the laptop. After using the fork to pry open the window to get to the veranda, shimmy through the narrow passage on the balcony to collect a red toolbox with the Dog's Head Emblem inside. Use the Dog's Head Emblem on the door in the Main Hall that leads to the yard. Check the note and the photo in the trailer to complete the scenario. If you're playing on PC, you can take advantage of Resident Evil 7 trainers to enable more cheats like infinite health and one-shot kills. The Steam Workshop makes it easy to download and integrate such mods.